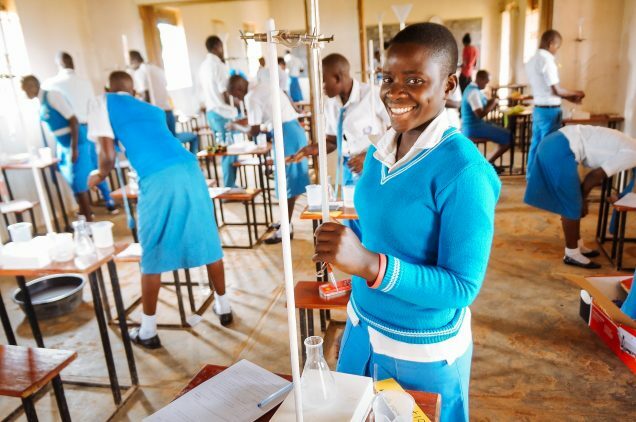 Photo: Girls in Chemistry lab at our Uganda rural high school are excited about the opportunities their diploma will unlock for them. We are happy to report that the crops growing on our farmland enterprise are flourishing thanks to our hardworking native team who are manually irrigating the plants with watering cans every evening, which is one of the methods that the President of Uganda demonstrated recently when he visited our village. The president encouraged farmers to use irrigation methods instead of only relying on rainfall, especially since the rainy seasons often change and thus are unreliable. The weather is currently very hot and the ground is dry, so along with the tiresome manual use of watering cans, our team is also utilizing another method the president taught them — they are attaching water bottles to certain plants for those who do not have a water source. This method involves fetching water manually from a water source, filling the water bottles, and tying them around each crop plant for a drip irrigation method, but it is only effective for a few crops and very labor-intensive. With your support, we are still seeking to raise $5,000 to purchase a piped irrigation system large enough for our farmland which will be a much more powerful and less labor-intensive irrigation method. Our native team’s painstakingly hard work of using water cans and the drip irrigation method as well as spraying pesticides and weeding has been very successful — oranges, mangoes, passion fruits, watermelons, collard greens, eggplants, tomatoes, green papers, avocados, onions, and bananas are all growing beautifully. The eggplants and onions are currently ready for harvest; the tomatoes, watermelons, and a few other crops will be ready for harvest in about 3 weeks; and the mangoes, oranges, avocados, passion fruits, and some other crops will be ready for harvest in approximately 2 years. We will use these crops to feed the children in our programs and we will sell the surplus to boost our program’s activities. We are also growing these crops in order to save money that would otherwise be spent purchasing the same food items at market. Thus, when all the crops reach full maturity and regular harvest times, we will save approximately $2,000 monthly, which is equal to about 21% of our monthly operating need. However, already, we are realizing about $1,300 monthly from the farmland, equal to about 13% of the monthly operating budget of our rural Uganda programs. Photo inset: (Top-left): 70 of our high school students recently took pre-final exams to prepare for national exams in October. (Top-right): Despite the hot weather and dry ground, crops growing on our farmland enterprise are flourishing thanks to the hard work of our native Uganda team. (Bottom-left): “Dembe,” rescued from a life of illness and poverty, is now excelling at our main campus high school. (Bottom-right): We are currently able to provide scholarships for 100 students, giving the great gift of a private high school education to children who would otherwise not be able to afford such a luxury. We are also happy to report that 70 of our high school students (ages 16-19) recently took their mock exams, which are pre-final exams to prepare the candidates in the subjects of math, English, geography, history, commerce, physics, chemistry, biology, fine art, economics, agriculture, computer studies, and their native language of Swahili for the national exams in October which are commissioned by the National Department of Education. In our high school there are 6 grades divided into 2 sections — lower and upper high school. The lower high school is comprised of grades “Senior 1-4” and the upper school is comprised of grades “Senior 5-6.” Grade 4 high school students are required to sit for a special national exam to verify that they qualify to enter upper high school which ultimately leads to graduation. 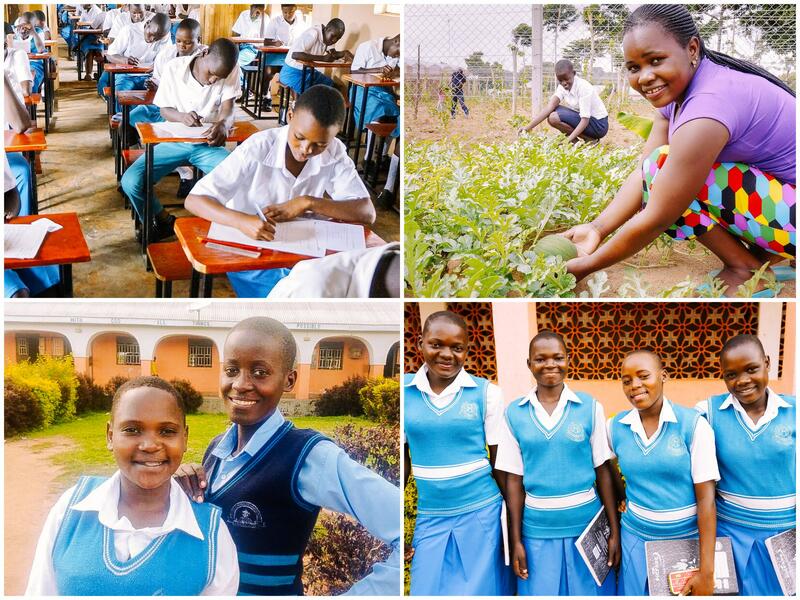 Out of the 300 students enrolled in our high school, we have 70 students in that situation who are being prepared to become purposeful citizens in Uganda. In further good news, we are now receiving 42% of our rural Uganda operating budget from tuition payments, and another 18% from other small business efforts. Donors provide 27% of our Uganda rural budget, which allows us to provide scholarships and resident care for our orphans. Thus, thanks to your generous support we are currently able to provide scholarships for 100 students, giving the great gift of private high school education to children who would otherwise not be able to afford such a luxury.